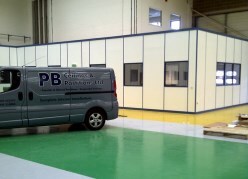 PB Ceilings and Partitions Ltd have 15 years experience in delivering quality services to a wide client base. We have supplied our superior products to schools and colleges, hospitals, the police services and all commercial premises including warehouses and shops. We work with building contractors to provide dry lining in new homes. We pride ourselves in delivering on time, to budget and to your specification. Suspended Ceilings have a variety of uses from the aesthetic to fire safety. We can work with you to hide ugly pipework, help soundproof your offices, provide a clean environment, install new lighting and improve fire safety. Create new offices or meeting rooms quickly and simply using our partitioning services. Solid, part or fully glazed partitioning to fit your requirements. Make the most of your workspace, add extra security and reduce potential fire damage to your building, as well as improving the environment as a place to work. Some of our flagship projects include working in schools and colleges installing wall, ceiling and floor panels for sound proofing purposes. 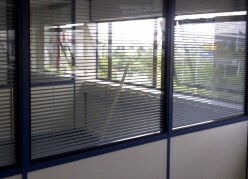 We carry out all kinds of refurbishments in shops, offices and other commercial premises. Based in Chelmsford, Essex, we cover all of London and the South East. Contact us to arrange your free estimate today! For all your ceiling, partitioning and sound proofing needs in London and the South East contact us on 07941 110480 or email us!